Openwater Habitat » IF IT’S TOO GOOD TO BE TRUE IT IS! IF IT’S TOO GOOD TO BE TRUE IT IS! We warned you in this post a year ago about miflex hoses. 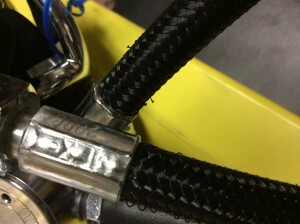 Now DAN (Divers Alert Network) posted a additional issue with these hoses. They allow for polymorphic crystallization corrosion on the inside constricting & potentially blocking the air flow. Cyclical heating & cooling at oil-water interfaces combined with the molecular structure of the internal tube lining promotes crystallization of these materials allowing growth to accumulate over time & that is just what’s happening inside! The external fiber woven sheath acts like a cheese grater. The hose sheath fibers collect sand, soils & vegetation. These hoses fray & the plastic sheath fibers stick out & can stab you! What is wrong with rubber? They are stronger, last longer, flex as much & cost less.